I'm in the final chute of "Fairwil," which means I fear my blog posts'll start to be... brain-dumpian, in nature, where I'm like "blahhhhhh, things on my mind," so please don't let me go there. I like a little polish in my presentation. But I'm thinking of selfies this morning, given that adorable Oscars selfie. Aside: Wouldn't Selfie be a great villain name? For a superhero story? I may write it. Because villains are pretty self-absorbed. So. I am not a selfie taker, which is to say we all probably are, to some extent, for various purposes. But the last selfie I took, in December, I'll share here, because of the circumstances. 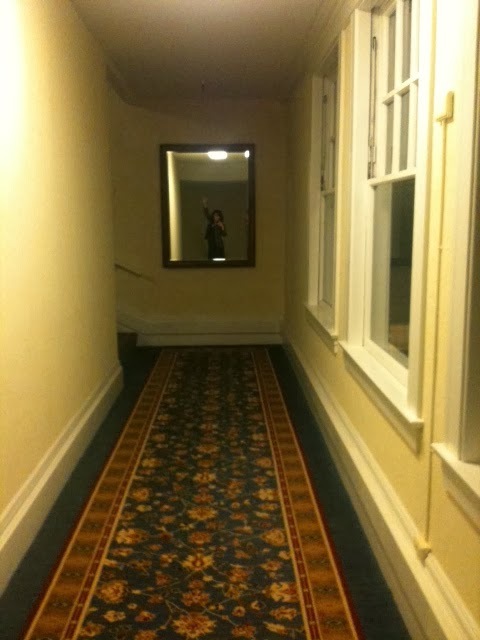 My best two pals wanted to wander a glorious old hotel in the Bay Area and look for ghosts late one night. We didn't come across any -- the Lady of Sequins must have been out on a hot date -- but I did snap a long hallway mirror shot, because long hallways scare me and I adore them. BUT. Right after I snapped the picture below, I got a nice email from a Wilfair reader in the east. It was midnight in Berkeley, meaning she was up at 3 a.m. So I wrote her back, seconds later, and said "hi! I'm on a spoooooky ghost hunt!" Which is to say this: I probably definitely scare my readers. I said as much to another reader yesterday -- hi, Amanda! -- and I'm okay with that. If I wrote some weird writer at 3 a.m. on a Sunday morning, I'd definitely want an immediate email back, straight from the scene of a hotel ghost hunt. Which is all to say if you write me, I can't promise I'll write you from a haunted hotel hallway, but you may get an invitation to eat crepes in LA with me, or come dance, or similar. BRAIN STUFF. Splat. Hitting the Wilfair blog, hard. Kind of feels amazing. Oof. More polish to come. It's Monday. Happy Monday, everyone! That's so eerie... of all the days for me to randomly stop by the blog! Have to admit, it WAS pretty cool to get an immediate response from the scene of a hotel ghost hunt. And the picture adds even more context for your evening.